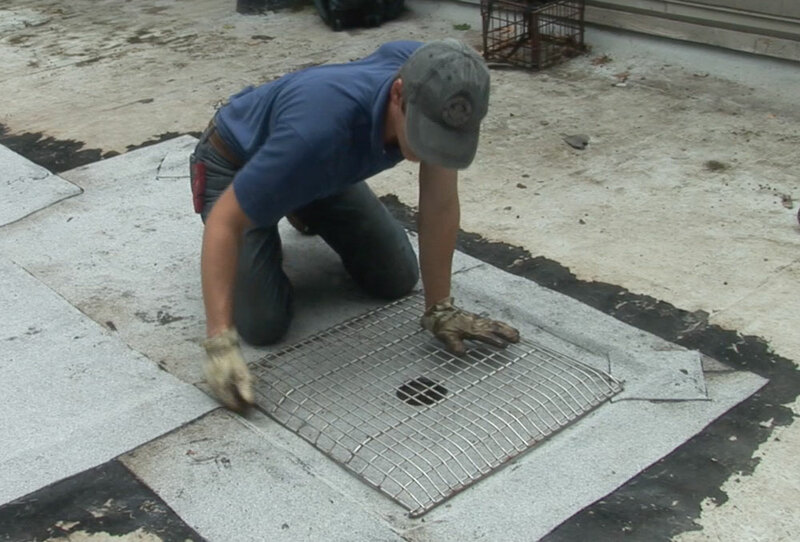 Location – Drains SHOULD NOT be installed next to other rooftop objects like A/C units, vent pipes, or skylights. Level -Drains SHOULD NOT be installed at a higher level than most of the roof surface. 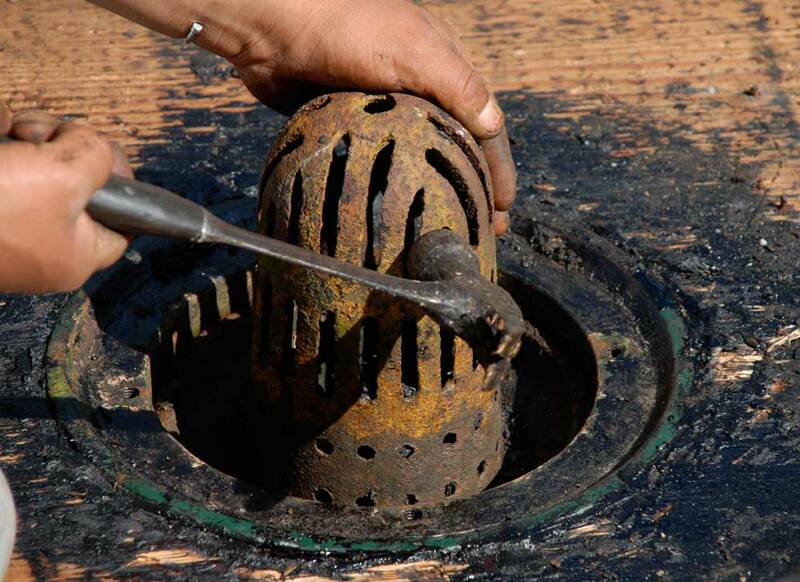 Strainers/Domes – Drain strainers SHOULD NOT have small mesh holes or openings; over time, small debris is trapped and causes restricted water flow. 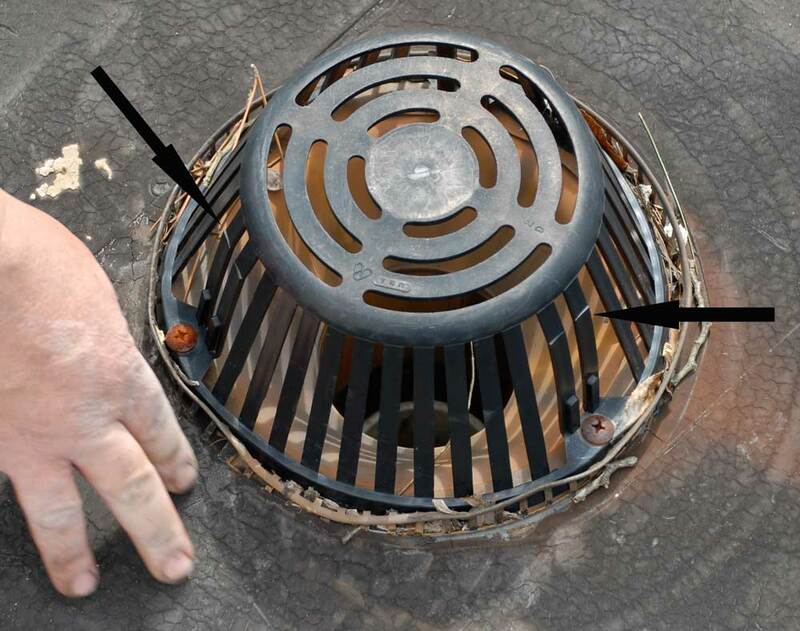 Dome strainers are too high in profile and provide the best conditions for debris build-up. Piping – Drains SHOULD NOT be too narrow because would not be able to handle the volume of water that needs to drain during rainstorms. Roof Slope – Drains SHOULD NOT be installed without the consideration of the proper angle for water flow. Trees – Trees SHOULD NOT hang over any part of a flat roof. Leaves and twigs will clog the strainers over the drains and cause water to pond. In the picture above, the drain was installed too close to the wall. The flow of water was restricted by debris around the drain and the flashing began leaking because the large accumulation of debris stayed wet. 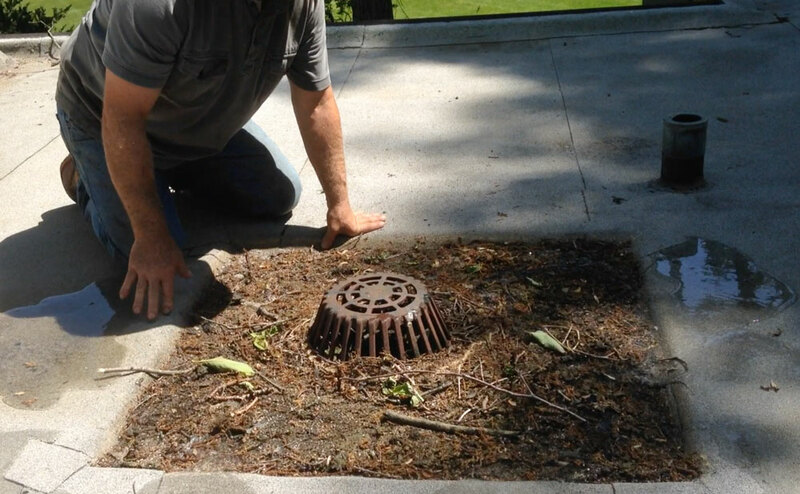 When a large accumulation of debris is finally carried towards the drain during a rainstorm, the drain becomes clogged and leads to a widened area of wet debris. Subsequent rainstorms cause more accumulation, and over time the layers of debris become the perfect conditions for the growth of moss, and the almost certain destruction of the roof’s membrane. The picture above is another example of a drain installed too close to a wall. We determined that not only was this drain placed too close to a wall, it was installed unnecessarily. This roof was designed to drain water to a gutter system. The solution would have been to build up the roof, or service the roof area with a scupper system. The video above shows one of the most common problems we find with both commercial and residential flat roofs. A drain should always be installed lower than the rest of the roof. A good roofing mechanic will remove the existing plywood and lower the drain to include a square catchment area around the drain. This will help with the collecting of debris. When we lowered the drain, we also added a double membrane for durability when snow shovels are used to maintain standing precipitation. 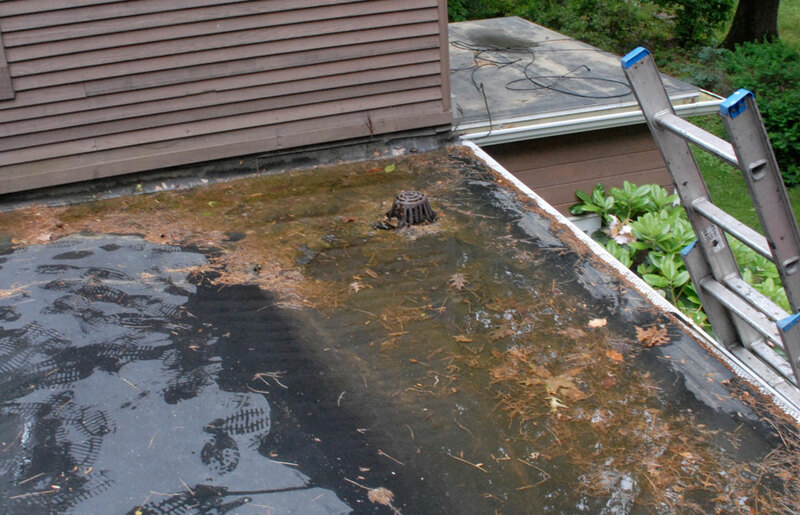 When we serviced this roof, we removed the roofing material and made a lower catchment area around the drain. This flat roof was pooling water. We lowered the roof around the drain and the drain itself. In the video above you will see how this flat roof has two areas of ponded water. To correct the issue we lowered the drain and hump area between the two ponds which provided a channel for water flow. This is an old fashioned cast iron strainer for a roof drain. Notice how small the holes are. Debris could not flow properly. Most strainers, or domes, that cover a drain are poorly designed. If appropriately designed, a strainer is supposed to keep larger objects from going down a drain, while allowing smaller debris through with water. Twigs, sea shells, and rocks should not be able to get through the strainer holes. These types of objects get stuck in the drainpipe; usually around an elbow and cause water blockage. The holes on these domes are too small for proper drainage. 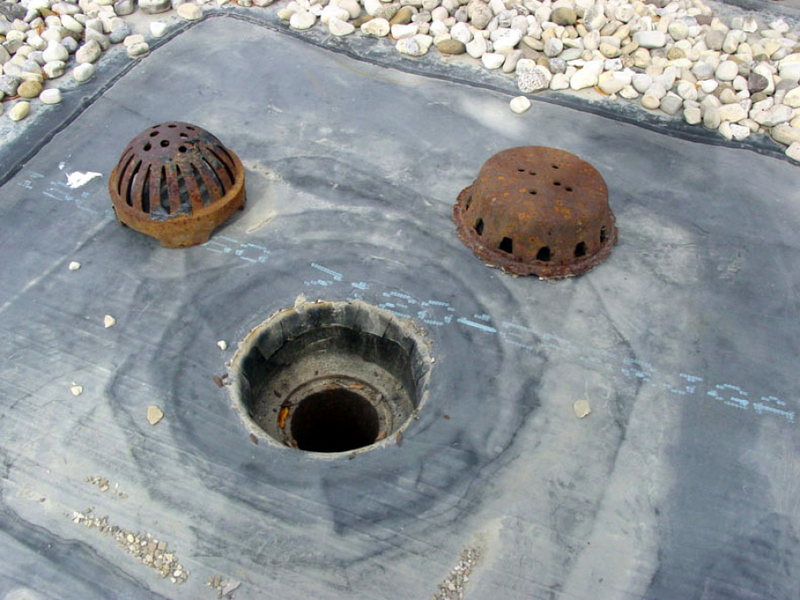 More often than not, a drain dome often traps small debris around it and water cannot get past the build up to flow through. It is our experience that plastic strainers, used to maintain proper water drainage, are the worst types to install. They degrade quickly by cracking. With the force of water during rainstorms, we see how the cracks can cause them to shatter leaving the drain to become clogged with large debris. This plastic strainer will crack and eventually shatter after only a few years of service due to ultraviolet light degradation. The drain and strainer combination in the picture below is an example of a good drainage system. The slots on the strainer are big and wide enough for small debris to flow through. If debris collects in the catchment area around the strainer, it is low enough so water could flow over the top of the debris and down the drain. This is a good example of a drainage system. In the picture below, we have found that the best strainer for any flat roof is one shown; it is 2 x 2 feet. It includes big slots or openings to let fine debris through. It is ideal when there is a catchment area around the strainer. This strainer has a lower profile than the dome-shaped strainer, which will prevent a high debris build-up on the strainer. This roof was lowered so that debris could collect around the strainer and water could flow over the top into the drain. As you have read, a strainer, or a drain filter, is an important part of a drain system. If well-designed, it will require only minimal maintenance with the removal of debris build-up from and around the strainer regularly. 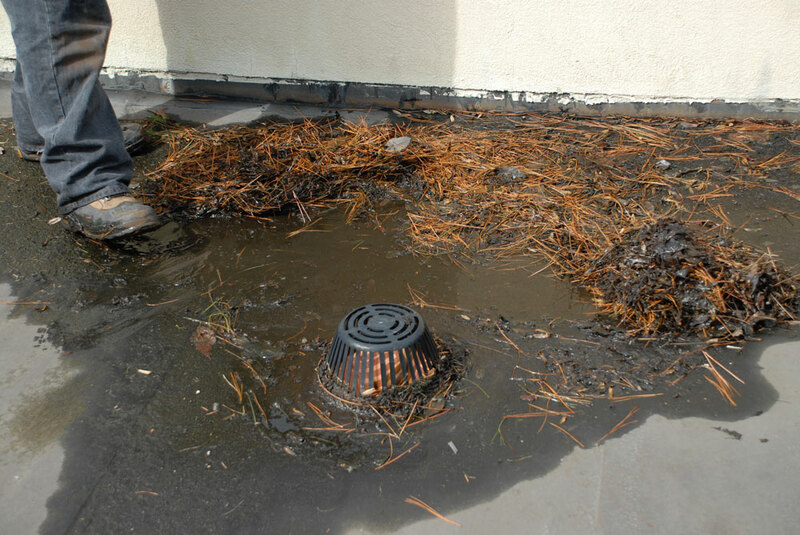 Often we are called to address large pools or ponded water lying on a flat roof because of improper drainage. These pools of water cause the roofing material to deteriorate prematurely, and can also become the breeding ground for mosquitoes. During the spring season, we have seen some flat roofs in such a state, that not only has moss grown in the damp areas, other types of plant life have thrived in the ponded areas. During winter months, these ponded areas freeze and cause stress to the roof structure which may affect the interior parts. We have found a tried and true way to alleviate the ponding of water where there is no slope for proper drainage. We cut in channels that are angled toward the draining area. 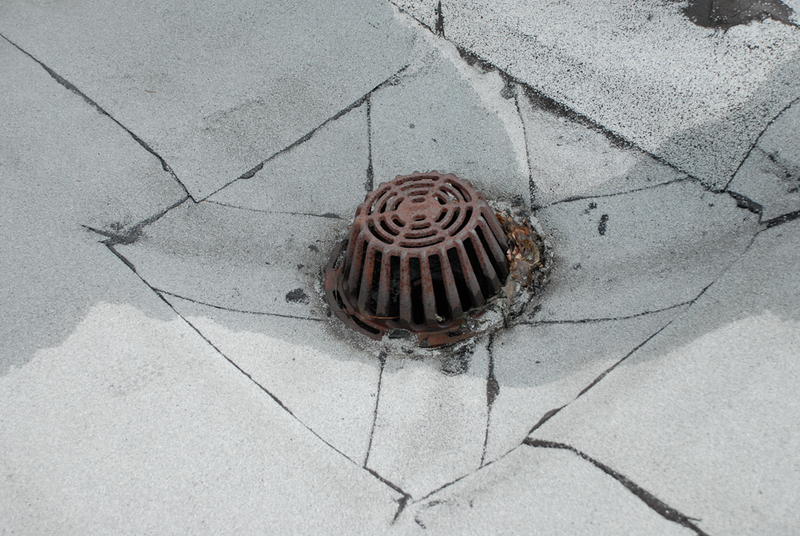 A simple channel can solve a flat roof drainage problem and preserve the life of the roof.